Rafael Osona Auctions trades in fine art by local, regional, national and globally recognized artists of the 18th -21st century. Known for our expertise and personal service, we evaluate single artworks or entire collections for sale, with significant prices realized in the Americana, Marine, Maritime and Nantucket Art Colony arenas. 12 Annual auctions connect high quality material with a discriminating bidding pool, for consistent success built on years of cultivating trust and relationships with connoisseurs and collectors of fine and decorative art in every price range. We are always available to discuss the sale of a single artwork or an entire collection. Click here to have your property evaluated for possible consignment. Overall 15 in. x 18 ¾ in. 20 in. x 52 in. Overall 27 ¾ in. x 59 ¾ in. Overall: 31 ½ in. x 31 ½ in. Tomakan attended the Art Student’s League in Manhattan and the Cooper Union of Art & Engineering. 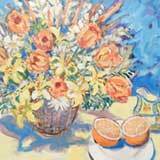 Her professional affiliations include The Lyme Art Association American Society of Marine Artists (ASMA), Rowayton Arts Association, Art Society of Old Greenwich and The Greenwich Art Society. Overall 13 in. x 15 in. signed lower right Anne Congdon, 1934. 11 ½ in. x 15 ½ in. Literature: A similar example painted in 1936 may be found in Robert A. DiCurcio’s “Art on Nantucket” pg 159, image 192. Robert Stark Jr. (1933-2014) Oil on Canvas “Red Sail in Polpis Harbor” a single sailboat passing a green headland under a luminous sky. Signed lower left R. Stark. 9 ½ in. x 19 ½ in. Overall 15 in. x 24 in. 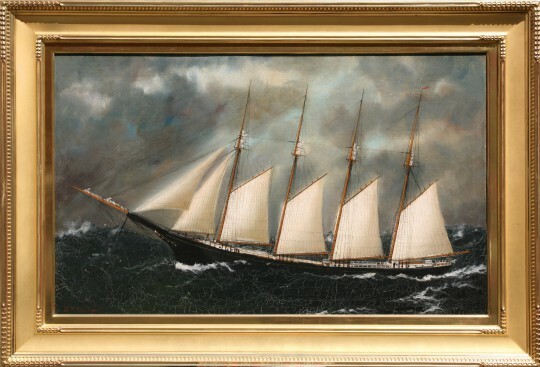 “Sunset Sail ‘Round Sankaty Light“, signed lower right R. Stark in 22k gilt and ebonized frame. “Brant Point Light” depicting one of Nantucket’s most iconic views, rosa rugosa in full bloom and seagulls in flight. Gilt frame with linen mat, signed lower right J. Cromartie. Pair of Andrew Shunney (American 1916-1978) Oils on Canvas “Floral Bouquets in Blanc de Chine Vases,” each signed lower left Shunney. 28 ½ in. x 10 ½ in. Theodore Jeremenko (American/Yugoslavian b.1938) Acrylic on Canvas “Bay Entry,” signed lower right T. Jeremenko, titled and signed on reverse of canvas. 20 in. x 25 in. Overall 26 in. x 31 in. Robert Stark Jr. (American 1933-2014) Oil on Canvas “A Single Red Sail,” signed lower left R. Stark. 48 in. x 67 in. Note: This painting was commissioned in 1988 and is thought to be one of Stark’s largest works of art. Suite of Twelve Studies of Various Hand Decorated Ceramic Plates, framed watercolors, gouache & ink on gray paper, French, 19th century, depicting examples of fine French, Dutch, Japanese and Chinese ceramic manufacture, each identified in hand lettering. 14 ¾ in. x 11 in. Overall 20 in. x 18 in. 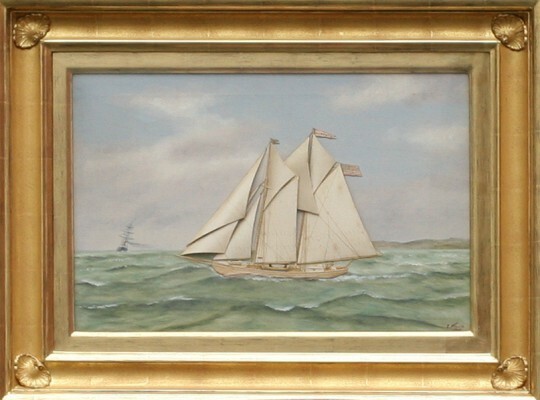 Wendell Macy (Nantucket 1845-1913) Oil on Artist Board “Offshore Rescue,” depicting a barque foundering offshore as a schooner and dory hasten to the rescue, signed and dated lower right, Wendell Macy, 1897, in a one inch molded wood frame. 6 ½ in. x 10 in. Frank Swift Chase (American 1886-1958) Oil on Artist’s Board “Swain’s Wharf, Nantucket,” signed lower right Frank Swift Chase, in a 1 inch gilt frame. 8 ¼ in. x 10 ⅜ in. 8 in. x 9 ½ in. Timothy H. Thompson (English b.1951) “America Wins,” oil on canvas, depicting the yacht America of the New York Yacht Club winning the race around the Isle of Wight on August 22nd 1851. America defeated the entire British fleet and the trophy she won, the £100 Ewer, became known as the America’s Cup. Depicted in the background the royal steam yacht Victoria and Albert carrying the royal family on a return trip from an Allum Bay excursion before Egypt Point on the northernmost tip of the Isle of Wight, signed lower left Thompson, in giltwood frame. Born in Hull, England in 1951, contemporary British historical marine painter Timothy H. Thompson has been painting for nearly forty years. His paintings focus on marine settings, particularly battle scenes and boats that span the centuries from fighting ships of Drake and Nelson’s eras to the epic journeys of clipper ships. Since the 1980’s a great deal of Thompson’s work has been directed toward painting private commissions of modern racing vessels. He has co-authored two books, The Paintings of the America Cup and The Story of Yachting, and has exhibited his work throughout the United States as well as England, France, Italy Belgium, Germany, Switzerland, Monaco and Australia. His work is popular in the market for contemporary marine painting. John O.R. Sharp was a student and friend of Grant Wood, having met in 1930 when a then young Sharp gave Wood a tour of Eldon, IA, guiding Wood to the Eldon farm which became the inspiration and subject for Wood’s iconic 1930 painting, American Gothic. Harry J. Sunter (New York, Massachusetts 1850-1900) “Mending the Nets”, oil on canvas, signed lower left Sunter ’85, in original frame. Note: A Harry J. Sunter oil painting inscribed on the stretcher “A Sand Beach, South Beach, Nantucket, Massachusetts, 1885” sold at Rafael Osona Auctions 02 August 1997 for $24,200. It is Osona’s opinion that this oil “Mending the Nets” also painted in 1885 was likely painted on Nantucket. Alan J. Eddy (Massachusetts b. 1940) “Opera Cup Race, 2013″, oil on canvas depicting seven yachts sailing in Nantucket Sound on deep blue waters, signed, in gilt frame. 24 in. x 48 in. signed lower right R. Stark. Anthony Thieme (1888-1953) Oil on Canvas “Twin Boats”, signed lower left A Thieme. As a strong proponent of the arts, Thieme held memberships to a great number of arts associations including the Art Allience of American, The Salmagundi Club, The Boston Art Club, The Boston Society of Artists and The National Arts Club among many others. He was also the founder of his own school, The Thieme School of Art in Rockport, MA. Thieme’s Work is held in high regard, the recipient of numerous awards and exhibited in many museums and galleries around the United States and Europe. He is represented in the collections of the Boston Museum of Fine Art, The Metropolitan Museum of Art, The Art Institute of Chicago, The Albany Institute of History and Art, The Dayton Art Institute, The Museum of Modern Art, The Los Angeles Museum of History & Art, as well as in museums in London and Brussels. Richard K. Loud (Massachusetts b.1942) Fine Art Oil on Linen “Catboats Sailing in Gloucester Harbor”, signed lower right Loud, in custom gold leaf frame. J. Evans “Two Children and a Gentleman”, 19th Century, pen and ink on paper laid on board. 12 ½ in. x 14 ½ in. An excellent example of the more formalized style Evans employed in later watercolors, as documented in he definitive biography of the watercolor artist J. Evans by Gail and Norbert H. Savage as it appears in the catalog from the museum exhibition catalog Three New England Water Color Painters (pub. 1974). This example is likely related to the exhibited watercolors listed as plate no. 13, 15, 17 and 18 in the catalog. Ralph Eugene Cahoon (1910-1982) Fine Arts Oil on Masonite “Mermaid Sailing in a Chinese Junk”, signed lower right R. Cahoon, in period Chinese Export frame. 42 in. x 26 in. Fine Art Oil on Canvas Portrait of Commodore Edward Preble (1761-1807), early 19th Century, depicting Preble sitting before a window with a view of Mt. Vesuvius and the USS Constitution in the distance. 43 ½ in. x 35 in. James E. Buttersworth (1817-1894) “Yacht Race Boston Harbor, 1865-1880”, fine art oil on wood panel views of the State House dome on Beacon Hill, Boston Light and Bunker Hill Monument and Fort Independence, signed lower right J.E. Buttersworth. 6 ¼ in. x 12 ¼ in. Boston was one of Buttersworth’s favorite settings. Thomas Brooks (British 1818-1891) “Portrait of a Young Lady and the Sea”, circa 1862, fine art oil on canvas depicting a young woman searching the rough seas, initialed and dated lower left “T.B. 1862” with label on reverse “14 Exchange Street, Manchester”. 20 ¼ in. x 16 ¼ in. Frank Swift Chase “High Surf, Nantucket” fine art oil on artist’s board, signed lower left Frank Swift Chase. 11 ¼ in. x 20 in. A Fine Arts Oil on Masonite, depicting a sailor boy with four mermaids and their bounty of fish, signed lower right R. Cahoon. 17 ½ in. x 23 in. depicting sailors from the ship “Hero” dancing on the boardwalk with approaching sailor and mermaid, patrons drink ale at the Mermaid Inn, a ship approaching headland in the distance. In custom frame by Eli Wilner & Co. New York, signed lower right. 25 ½ in. x 38 in. Tim Thompson Oil on Canvas “Yankee Visits England, 1935″, signed lower right Thompson in gold leaf frame. 7 ½ in. x 9 ½ in. “Navahoe, Dartmouth Regatta, 1893″, signed lower right. Thompson spent his childhood living on the tiny Channel Island of Herm and that is where he developed a love and respect for the sea. He created his first watercolor of the ship Queen Mary at the tender age of 6. In 1982 he met Ted Turner at a regatta in Cowes, England and Turner commissioned him to paint numerous sailing boats which brought him growing popularity and recognition. Thompson has exhibited his work in the United States, London, Paris, Italy, Belgium, Germany, Switzerland, the Vasa Museum in Sweden, Monaco, Brazil, Australia and New Zealand. “Beached”, signed lower right A. Packard. Through her complex brushwork, Packard’s land and seascapes convey a deep awareness of nuances in light, color and composition, which heavily attribute to her reputation as one of the most renowned artist’s in the Provincetown Art Colony in Massachusetts. “Afternoon Catboat Sail”, signed lower right Keane. Keane is a life long artist with a special affinity for the sea. He studied with artist Marshall W. Joyce, eventually becoming his studio partner. Additionally Keane was employed for many years by General Dynamics as a technical illustrator. An instructor of painting for Copley Society of Boston, he has taught painting for over fifteen years. 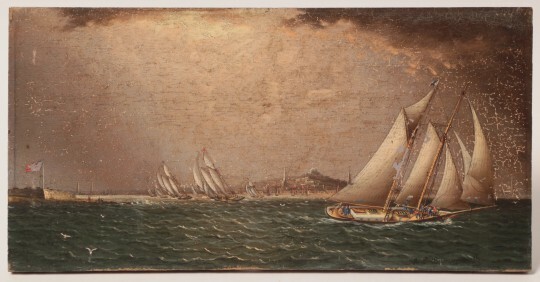 “Yachting Race Off of Nantucket”, signed lower right William R. Davis. Davis, grew up in Hyannis Port, Massachusetts. A self-taught artist he captures the serene light of a sunrise or sunset on the water. In 1987 he mounted a one artist show at the Mystic Maritime Gallery and all twenty of his works shown were sold. He has received the Mystic Maritime Gallery Award of Excellence. His art pays homage to such 19th C. artists such as James Bard, Antonio Jacobsen and Fitz Hugh Lane. 7 ½ in. x 11 ¼ in. Study for “Ahead of the Mark”, signed lower left Keane. Keane is a life long artist with a special affinity for the sea. He studied with artist Marshall W. Joyce, eventually becoming his studio partner. Additionally Keane was employed for many years by general dynamics as a technical illustrator. An instructor of painting for the Copley Society of Boston, he has taught painting for over fifteen years. Ralph Eugene Cahoon (1910-1982) “Riding the Whale”, oil on board depicting three mermaids and three sailors riding a whale, signed lower right “R.Cahoon”, in an antique gilt frame. Tony Sarg (1880-1942) “Welcome Home from the Widow’s Walk”, watercolor on paper, signed lower right Tony Sarg. A very rare piece, this was one of the original studies for the famed poster. Louis Benton Akin (American 1868-1913) “The Pueblos”, oil on artist board, signed indistinctly lower left. 15 ¾ in. x 19 ½ in. 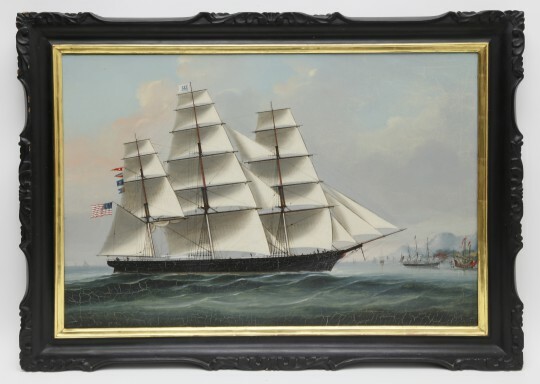 William Pierce Stubbs (American, 1842-1909) “Portrait of the Four Masted Schooner O.H. Brown” Oil on canvas, signed lower left, framed. 28 in. x 46 in. Overall 38 in. x 56 in. 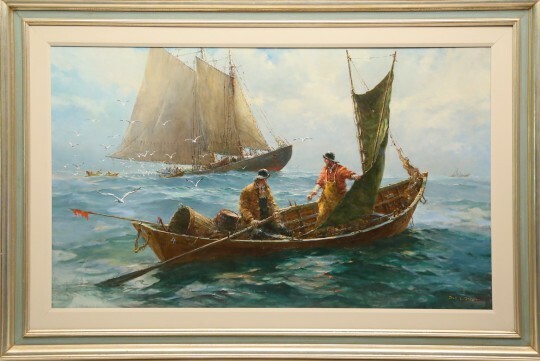 Thomas Willis (American, 1850-1925) “Portrait of the Fishing Schooner Alberta” Silkwork on canvas, signed lower right, framed. 16 in. x 20 in. Overall 24 in. x 28 in. 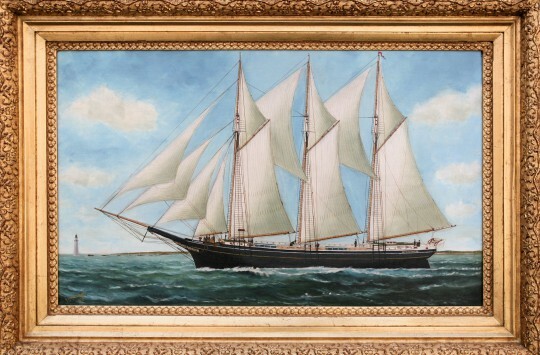 Solon Francis Montecello Badger (Massachusetts, 1873-1919) “Portrait of the Three Masted Schooner F.H. Odiorne Off Minot’s Light” Oil on canvas, signed lower left, in gilt frame. 22 in. x 36 in. Overall 30 in. x 43 in. Maurice Brainchon (1899-1979) “Maurine-Bateaux de Peche” oil on canvas, signed lower right Brianchon. 28 ¾ in. x 23 ½ in. Maurice Brainchon (1899-1979) “Menton” oil on canvas, dated 1959, with figures, tables and flags on tiled ship deck, signed lower left Brianchon, signed and dated on reverse. Jane Peterson (American 1876-1965) “Prams Along the Beach”, oil on canvas, depicting beach shore scene with figures walking along sand, signed lower right, Jane Peterson. Provenance: Hollis Taggart Galleries, Menconi & Schoelhopf Fine Art LLC. Robert Stark Jr. (American, Contemporary) “Rainbow Fleet” oil on canvas, signed lower right R. Stark. In a dot and cross gilt frame. Robert Stark Jr. (American, Contemporary) “Out With the Rainbow” Oil on Canvas, signed lower left R. Stark. In a carved gilt rope and ebonized frame. Stark is as illuminist, painting principally in oil on canvas or panel. His work is represented in numerous private and corporate collections in the US, Canada, Ireland, Great Britain, Germany, France, China and the Baseball Hall of Fame, Cooperstown, N.Y.
Samuel Edmund Oppenheim (American, 1901-1992) “Portrait of a Geisha”, oil on canvas, signed mid right, Oppenheim worked in New York and was known for his illustrations and paintings.